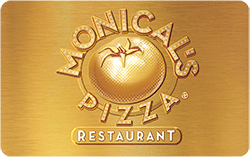 An eGift is a Monical’s Pizza digital gift card sent via email that your recipient can redeem and enjoy in-store or for ordering Monical’s food online. Just choose an eGift design, add the amount you’d like to give and a personal message, enter an email address, then hit send. Choose your eGift design here. 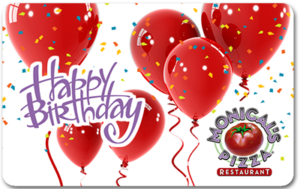 Want to send a Monical’s Pizza gift card via regular mail? Buy one here.